Market Manila - Braised Lamb Shanks a la Michael Psilakis - Beef/Lamb, etc. Podarakia Arniou Me Kritharaki. That’s Greek to me. Heehee, literally. :) That’s what this dish is called in Michael Psilakis’ cookbook entitled “How to Roast a Lamb”. 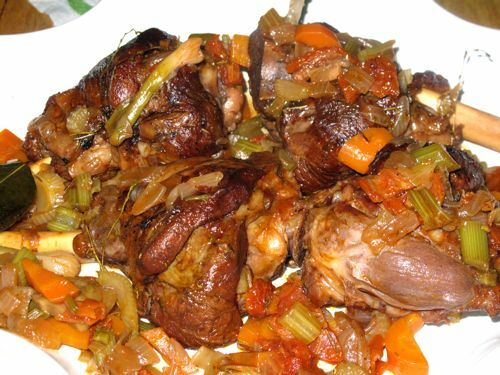 Essentially, it is braised slow-roasted lamb shanks with a tomato and wine sauce. It was superb. I made this a few nights ago for our annual “Anti-Valentine’s Valentine’s Dinner” with just a few guests over that evening. Sister is also in town so she ate this as well (while I suffered with prawns and a green salad). 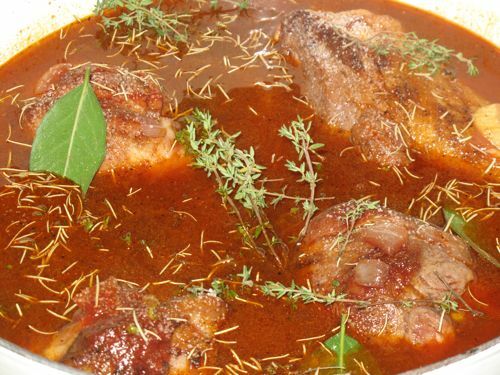 If you like lamb shanks, you will probably LOVE this recipe and it was so incredibly easy to make… I tried to follow the recipe rather closely, but because I had some other ingredients on hand, I improvised a little. 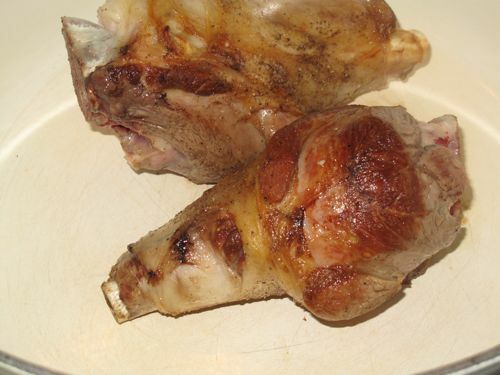 First, I started off with four nice meaty lamb shanks, PHP1,500 roughly at Santis delicatessen. I thought this would feed four people nicely, but in fact, it would probably feed six quite comfortably. Into a large cast iron pan over medium high heat, I added roughly 3 tablespoons of vegetable oil and just under a tablespoon of olive oil. I then browned the defrosted, and patted dry with paper towels shanks in the oil, turning to brown all sides of the meat. I browned two shanks at a time, so as not to “crowd” the pan, then placed the browned shanks into a large enameled dutch oven or oven-proof casserole (this one happens to be a Le Creuset). Drain all but 2 tablespoons of fat from the cast iron pan and return to the heat. 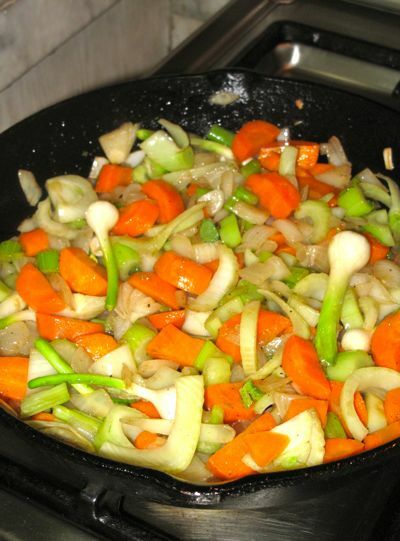 Add a classic mirepoix combination of white onions, celery and carrots, roughly chopped. I used about 1.5 cups of each. I happened to have some nice organic fennel bulbs on hand and chopped those up and added them to the mix as well. Ditto for some 10 pieces of very young garlic bulbs. Saute all of these for a few minutes until the vegetables start to glisten and soften. Next I added about 4 tablespoons of tomato paste to the pan and stirred for about a minute, before adding 2 cups of red wine to “deglaze” the pan. 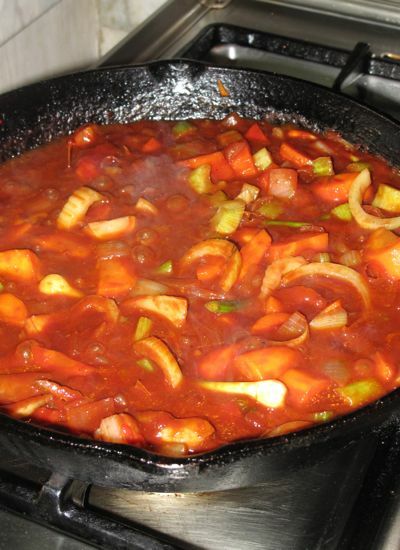 Stir to let the alcohol evaporate and you will have a nice thick, flavorful sauce. Actually, it is generally a bad idea to cook wine and tomatoes in a cast iron pot as acids and iron are not a good match, but I was a bit lazy and trying to save washing another saute pan. Just do this step quickly and it should be okay. Next, I added roughly 8 cups of beef broth to the mixture and stirred until it was just simmering. I carefully dumped the vegetable and wine/broth mixture over the lamb shanks in the other pan, added more beef broth and some water until the shanks were just barely covered, and added in 4 fresh bay leaves (use 2 dried if you don’t have fresh) from the garden, 5 sprigs of fresh thyme, 2 sprigs of fresh rosemary, and salt and pepper to taste. Don’t overdo the salt just yet, the liquid will boil down and get far more concentrated. Start with 1/2 tablespoon of kosher salt and adjust later. Check your pot to make sure the liquid does not come to a boil, rather a gentle gurgle, less violent than the lava boiling over in a Hawaiian volcano, is all you need. 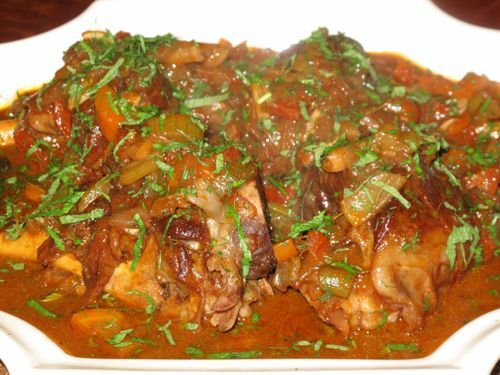 The lower the gurgle, the more fantastic the lamb shanks. If you think the oven is too hot, lower the heat a bit. I promise you that the aromas that will invade your kitchen and home after about the first hour of cooking will be heavenly. This is comfort food at its best! When it’s done, carefully remove the shanks onto a serving platter and scatter vegetables around it. Take the sauce and put it over a high flame for some 15+ minutes to reduce it to a thicker consistency. Meanwhile, stick the platter of meat in the oven with heat turned off, to keep it warm… While reducing the sauce, I added about two whole bulbs worth of garlic that were slow roasted to a sweet fragrant mush. Oooh, lamb shanks are my favorite item on the menu at the Elephant Bar. I have to try this recipe. Thanks. Did you use the decorative wooden fork hanging on the wall? Just in time,MM. 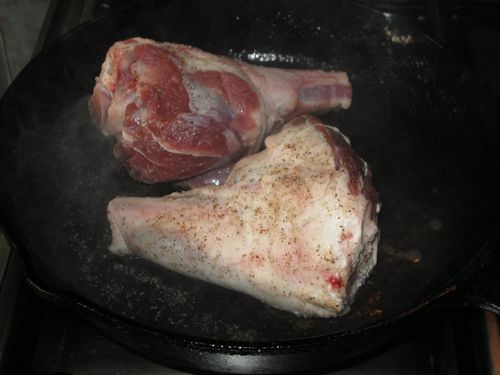 Was going to look for a recipe for braised lamb shanks as I have 4 pieces in my freezer waiting to be cooked! Will definitely try this. 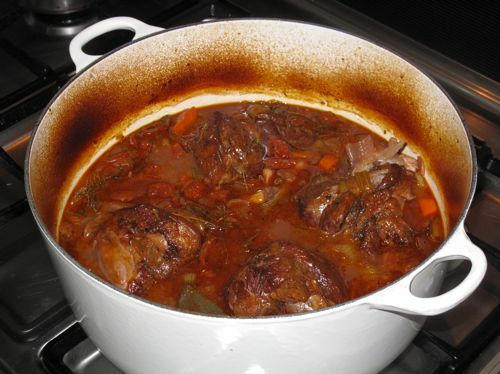 Can I brown the lamb shanks in the le Creuset and cook the mirepoix there too? I love lamb. I remember harassing the servers to give me at least three chops during meals in the dining facilities of Kandahar Airfield. Looks so good I can almost smell it from here! I don’t know how you can bear to eat just one spoonful. One tip though, dishes like this always improve if made ahead. Stored overnight in the fridge, you can then take off the congealed fat from the top before reheating (and there would be a lot of fat with lamb) and enjoy guilt-free even while watching your weight. I’m not a big fan of LAMB…. 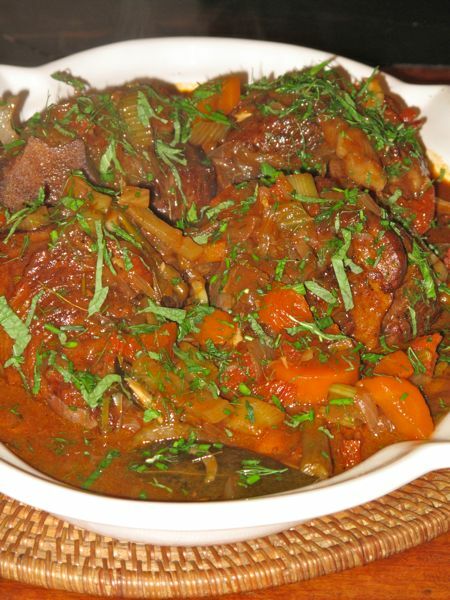 i tried making lamb stew “kalderetta style”. It was pretty good. I marinated the lamb in malt vinegar, peppercorns & bayleaves to get rid of the gamey aftertaste. Glad to see you still cooking and eating while on a diet! FYI, I’ve browned meat in my Le Creuset for years with no enamel problems. Also, I got one of the Lodge dutch ovens, and it’s a dream, especially for the price. i can almost smell that! i swear by my lodge dutch oven, but i find that stews with tomato sauce or wine tend to taste tinny. my hubby and kids don’t detect it at all, but i always insist there’s a metallic taste and it bothers me, so i’ve stopped using cast iron for recipes like this. also, i always dust my shanks with flour before browning them, the better to thicken the sauce – more out of habit, actually. 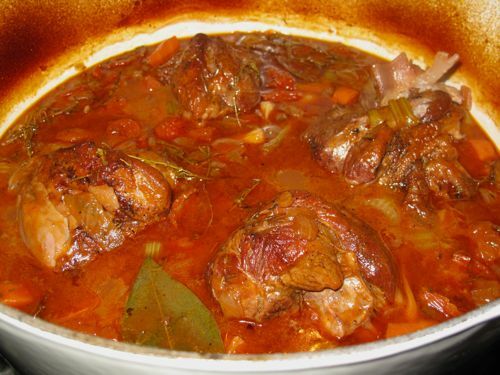 but am going to try this flourless version with some beef shanks i’ve got in the freezer right now. why oh why do i check your site at this time of the day? this post made me so hungry. HÃ©-hÃ©, @kim e, I check the same site from long, long time. I’m looking for a MM’s miracle. AprÃ¨s ce merveilleux agneau voici une bonne “soupe tonkinoise”. Oh my, this looks absolutely heavenly! I can almost taste it! I’m salivating at the sight of this. It looks quite easy to do. Happy to report that I cooked this today just as you described it and it was very good! Everyone liked it. Thanks, MM! Hi MM, if the menu calls for red wine, what kind or brand do you use, approximately how much should a bottle for cooking cost? Anyway, surfed the net and found a recipe which sounds like this although the recipe included adding a bouquet garni of herbs like rosemary, etc. As for the wine … I agree that there’s no need to have a ‘cooking wine’ on hand. When I was cooking, I realized we had less than a cup of red wine left over (shiraz or something) so I decided to use up what was left of a bottle of Jack Daniel’s Tennessee Whiskey rather than wine – about 2 cups worth. Good thing the akyat bahays were probably asleep also from the heavenly smell of cooking!